Joe Ozaki, DJ Ida, Karen Murakami, Gary Yamashita. It has been 90 years since the birth of the Rev. Dr. Martin Luther King Jr., an activist and civil rights leader whose words and deeds continue to impact and inspire the world. 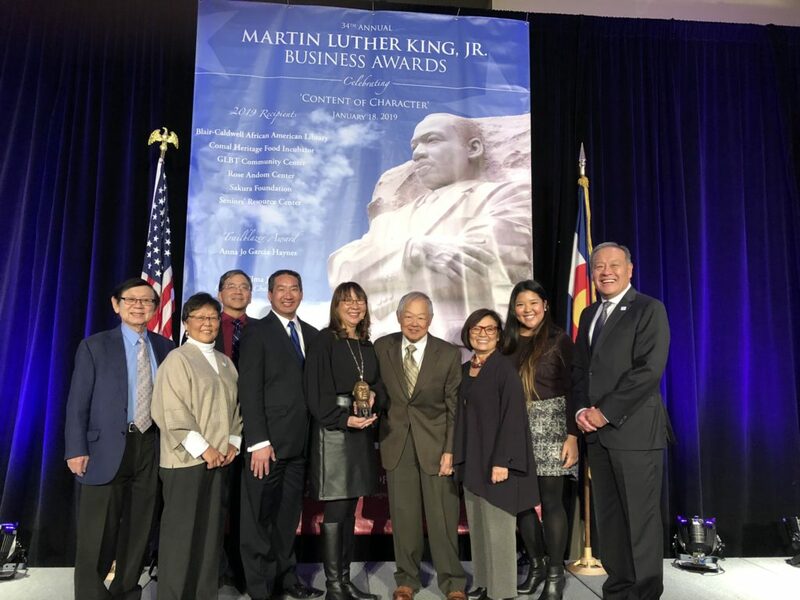 On January 18, 2019 at the Hilton Denver City Center Hotel, the following Martin Luther King Jr. Business Award recipients were recognized: Blair-Caldwell African American Library, Comal Heritage Food Incubator, GLBT Community Center, Rose Andom Center, Senior Resource Center, Anna Jo Garcia Haynes and Sakura Foundation. Sakura Foundation is humbled and honored to be an award recipient. The Foundation acknowledges the need to bring the community together beyond ethnic lines in order to contribute to the inclusiveness of the region. As recognized by Dr. King, there continues to be a need to ensure that the injustices of the past are not repeated, so long as cries and actions are made against such groups as the LGBTQ community, Muslims and immigrants. To this point, Sakura Foundation hosted “Living In Hope: A Mother & Her Transgender Son’s Journey,“ featuring authors Marsha and Aiden Aizumi, provided a sponsorship to the National Queer Asian Pacific Islander Alliance (NQAPIA) Conference and participated in an API story-sharing panel discussion hosted by the Denver chapter of PFLAG (Parents, Family and Friends of Lesbians and Gays). These events focused on bringing understanding and inclusiveness to all people. Through its community grants, donations and sponsorships, Sakura Foundation expands its reach and impact of goodwill to the greater community. In the spirit of Dr. King’s indelible and substantial contributions, Sakura Foundation is proud of the relationships it has established and cultivated with many organizations and individuals within the community. Congratulations to all the recipients of the 2019 Martin Luther King Jr. Business Award. A video introduction of the awardees can be viewed at http://www.mlkbusinessawards.org/. Copyright © 2014- Sakura Foundation.